American politician, was born in Bertie County, near Windsor, North Carolina. He was twice a member of the Continental Congress and a delegate to the Constitutional Convention at Philadelphia in 1787, and to the state convention which ratified the Federal Constitution for North Carolina in 1789. From 1790 until 1796 he was, by George Washington's appointment, Governor of the "Territory South of the Ohio River" created out of land ceded to the federal government by North Carolina in 1789. He was also during this period the Superintendent of Indian Affairs for this part of the country. In 1791 he laid out Knoxville as the seat of government. He presided over the Tennessee State Constitutional Convention in 1796, and, upon admission to the Union, became Senator. 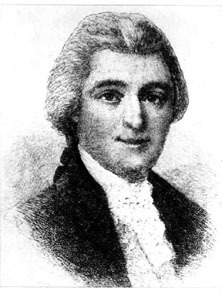 In 1797 a letter in his hand surfaced, laying out what is now known as "Blount's Conspiracy." It provided for the cooperation of the American frontiersmen, assisted by Indians, and an English force, in the seizure on behalf of Great Britain of Florida and Louisiana, then owned by Spain. As this scheme would upend the neutrality of the United States, and in particular breach a 1795 treaty with Spain, Blount became the first Senator to be expelled, "having been guilty of high misdemeanor, entirely inconsistent with his public trust and duty as a senator." An attempt was later made for impeachment, but the Senate, sitting as a court of impeachment, determined that it had no jurisdiction. Blount's Conspiracy was disavowed by the British government, which, however, seems to have secretly favored it. Blount was enthusiastically supported by his constituents, and upon his return to Tennessee was made a member and the presiding officer of the State Senate. In the last year of his life, Blount's health declined rapidly, and he died at Knoxville on the 21st of March 1800. Old Style, 26 March 1749. New Style, 6 April 1749.